When selecting SKF bearings for any purpose, ultimately you want to be certain of achieving the required level of equipment performance, and robustness, at the lowest possible cost. There are key factors you must consider when selecting SKF bearings for an application. For helping you evaluate these key factors, we provide recommended SKF bearing selection, as well as supporting information. 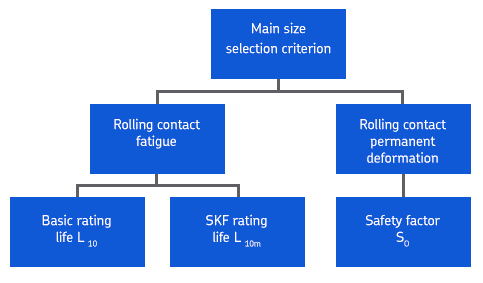 The SKF bearing selection provides a straight forward step-by-step approach that shows the general relationship between each step. 1, Performance and operating conditions. The drawing shows the relationship between principal operating conditions, application requirements and various aspects of a bearing arrangement’s design. The lists are not comprehensive and you may have to consider other factors and interrelationships, such as cost and availability, when striving to obtain a robust and cost-effective solution. Each SKF bearing type has characteristic properties that make it more or less suitable for use in a given application. This section provides information on what to consider when selecting a bearing arrangement and the types of bearing to use with it. It also provides guidelines on choosing bearing types to satisfy specific demands of an application, such as accommodating available space, loads, misalignment, and more. For applications where bearings are running in typical operating conditions – i.e. normal speeds, good lubrication conditions and not highly or peak loaded. – use Size selection based on rating life. They influence many performance characteristics of an application and its parts, and do so in various ways depending on the operational state, such as at startup or in normal operation, when steady-state conditions have been reached.